Live 4 Bikes is a Bicycles shop in the City of Bellflower. Our customers come from LA County, Orange County, San Bernardino County and the Valley just because they know they will save money buying their bicycles Live 4 Bikes. Live 4 Bikes is always fully stocked with fixies, beach cruisers, road bikes and mountain bikes, in addition to the bikes we have a full service repair center. One of our main focuses is to provide these bikes so they can be used for commuting, exercise, and performance or recreational. Live 4 Bikes started as a home business in 2009. We started off by buying, selling, trading and repairing bikes. To this day we still live up to our motto; “Buy, Sell and Trade". Over the years Live 4 Bikes has gained incredible mechanical skills, we would consider this skill to be one of our strongest. We are fixing bikes on a daily basis, not only do we understand the mechanics but we have the most affordable prices around. You can rest assure that when you bring your bike to Live 4 Bikes for repairs it will leave our shop riding at its best. The most important thing to us is making sure that are customers are satisfied with any purchase made in our shop. Our Live 4 Bikes customers have been extremely happy with the customer service that we provide, and we appreciate every reference that comes our way. Our Live 4 Bikes customers love our custom bikes and recommend us to all of their friends because they love our work. Over the years we have custom made hundreds of fixies; we get in a lot of customers who ask us for this specific item. Live 4 Bikes is well known for their fixie bikes and this is because of our wide selection in brands, colors, parts and the ability to have them customized to the customer’s satisfaction. Live 4 Bikes is proud to provide you with brand name bikes, such as: Felt and KHS. Felt and KHS would be considered our “high end” performances bikes that are usually used by the pros. Because we buy and sell buys we also come across brands like Trek, Specialized, Cannondale, Bianchi, Fuji and Giant. These types of bikes sell fast so make sure you stay in close connection with Live 4 Bikes. 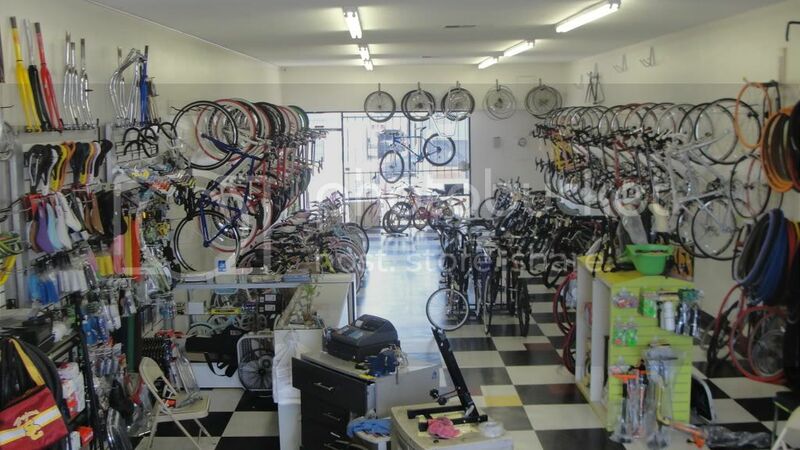 One of our most popular and unique way of doing business is by allowing our customers to trade-in their bikes or parts. Whatever the value may be, this can be put toward a new bike or new parts. So that both parties are satisfied, we negotiate an amount that will work for us both. Stop by the store and let us prove to you that we are committed to give you the best bike buying expedience we can do. bars riser flat wing pro drop tt stem 3t ergosum ergonova ea70 ec70 ea90 ec90 easton ritchey ea50 ea30 stella azurra fsa dt swiss white industries 7800 7900 7700 6500 6600 6700 105 hub hubs american classic brass alloy parlee, crumpton, ti titanium shimano, sram, serotta, seven, moots, bottom bracket, bb, taper, square, brakeset, caliper, road, hybrid, new, nos, used, group, gruppo, drivetrain, top of the line, crank, cranks, crankset, rd, fd, super record, dura ace, Mountain bike, bicycle, full suspention, down hill DH free ride Foes, Pivot, Titus, Ellsworth, Spot, Sycip, Salsa, Intense, Santa Cruz, Superlight, Blur, Butcher, Rocky Mountain, Kona, Giant, Specialized, Ellsworth, Ventana, Ibis, Rock Shox, Fox, Manitou, Answer, Foes, Moutain Cycle, Chumba, Race Face, Avid, Shimano, SRAM, Thomson, Easton, Oury, Bontrager, Selle San Marco, Hope, Kenda, Velocity, WTB, Mavic, Maxxis, Kalloy, Cane Creek, Marzocchi, AMP Research, Horst Leitner, TruAtiv, Kona, KHS, GT, David Turner, Sette, Salsa, Trek, Gary Fisher, Continental, Ringle, Sun, Chris King, 29", 29r, 29er, Niner, YETI SPECIALIZED TREK GARY FISHER SANTA CRUZ MOUNTAIN BIKE FULL SUSPENTION IBIS tag: gt trek specialized hardrock rockhopper disc brakes ready hard rock 2.0 3.0 1.0 trail road fixie fixed honda kawasaki v-brakes rei kona novara marin raleigh gary fisher cannondale mongoose giant schwinn rocky diamond back bianchi haro huffy fuji foes pacific motiv santa cruz k2 iron horse bmx mtn road racing track 24 26 27 7 8 small medium large 13 15 17 18 19 xl disk 2.2 2.35 2.1 mountain bicycle disc beach cruiser hr ironhorse comp expert race sport xtr xt hardtail Dakar xlt warrior tassajara 3500 3900 3700 4300 4500 6000 6500 6700 8000 9.9 9.7 820 wahoo advance tarpon mamba superfly kaitai high-end full suspension hardtail mtb wtb hard rock rock hopper blackmarket fixed gear bmx parts trade fit subrosa odyssey bontrager road bike north hollywood san fernando valley van nuys burbank cinelli mash shun single speed seat seatpost bars origin 8Bellflower Bicycle Bike shop store . We also serve the Norwalk , Lakewood , Cerritos Downey whittier , long beach , paramount and los angeles areas . Bellflower Bicycle Bike shop store . We also serve the Norwalk , Lakewood , Cerritos Downey whittier , long beach , paramount and los angeles areas . Bellflower Bicycle Bike shop store . We also serve the Norwalk , Lakewood , Cerritos Downey whittier , long beach , paramount and los angeles areas . Bellflower Bicycle Bike shop store . We also serve the Norwalk , Lakewood , Cerritos Downey whittier , long beach , paramount and los angeles areas . Bellflower Bicycle Bike shop store . We also serve the Norwalk , Lakewood , Cerritos Downey whittier , long beach , paramount and los angeles areas . Bellflower Bicycle Bike shop store . We also serve the Norwalk , Lakewood , Cerritos Downey whittier , long beach , paramount and los angeles areas . Bellflower Bicycle Bike shop store . We also serve the Norwalk , Lakewood , Cerritos Downey whittier , long beach , paramount and los angeles areas . Bellflower Bicycle Bike shop store . We also serve the Norwalk , Lakewood , Cerritos Downey whittier , long beach , paramount and los angeles areas . Bellflower Bicycle Bike shop store . We also serve the Norwalk , Lakewood , Cerritos Downey whittier , long beach , paramount and los angeles areas . Bellflower Bicycle Bike shop store . We also serve the Norwalk , Lakewood , Cerritos Downey whittier , long beach , paramount and los angeles areas . Bellflower Bicycle Bike shop store . We also serve the Norwalk , Lakewood , Cerritos Downey whittier , long beach , paramount and los angeles areas . Bellflower Bicycle Bike shop store . We also serve the Norwalk , Lakewood , Cerritos Downey whittier , long beach , paramount and los angeles areas . Bellflower Bicycle Bike shop store . We also serve the Norwalk , Lakewood , Cerritos Downey whittier , long beach , paramount and los angeles areas . Bellflower Bicycle Bike shop store . We also serve the Norwalk , Lakewood , Cerritos Downey whittier , long beach , paramount and los angeles areas . Bellflower Bicycle Bike shop store . We also serve the Norwalk , Lakewood , Cerritos Downey whittier , long beach , paramount and los angeles areas . Bellflower Bicycle Bike shop store . We also serve the Norwalk , Lakewood , Cerritos Downey whittier , long beach , paramount and los angeles areas . Bellflower Bicycle Bike shop store . We also serve the Norwalk , Lakewood , Cerritos Downey whittier , long beach , paramount and los angeles areas . Bellflower Bicycle Bike shop store . We also serve the Norwalk , Lakewood , Cerritos Downey whittier , long beach , paramount and los angeles areas . Bellflower Bicycle Bike shop store . We also serve the Norwalk , Lakewood , Cerritos Downey whittier , long beach , paramount and los angeles areas . Bellflower Bicycle Bike shop store . We also serve the Norwalk , Lakewood , Cerritos Downey whittier , long beach , paramount and los angeles areas . Bellflower Bicycle Bike shop store . We also serve the Norwalk , Lakewood , Cerritos Downey whittier , long beach , paramount and los angeles areas . Bellflower Bicycle Bike shop store . We also serve the Norwalk , Lakewood , Cerritos Downey whittier , long beach , paramount and los angeles areas . Bellflower Bicycle Bike shop store . We also serve the Norwalk , Lakewood , Cerritos Downey whittier , long beach , paramount and los angeles areas . Bellflower Bicycle Bike shop store . We also serve the Norwalk , Lakewood , Cerritos Downey whittier , long beach , paramount and los angeles areas . Bellflower Bicycle Bike shop store . We also serve the Norwalk , Lakewood , Cerritos Downey whittier , long beach , paramount and los angeles areas . Bellflower Bicycle Bike shop store . We also serve the Norwalk , Lakewood , Cerritos Downey whittier , long beach , paramount and los angeles areas . Bellflower Bicycle Bike shop store . We also serve the Norwalk , Lakewood , Cerritos Downey whittier , long beach , paramount and los angeles areas . Bellflower Bicycle Bike shop store . We also serve the Norwalk , Lakewood , Cerritos Downey whittier , long beach , paramount and los angeles areas . Bellflower Bicycle Bike shop store . We also serve the Norwalk , Lakewood , Cerritos Downey whittier , long beach , paramount and los angeles areas . Bellflower Bicycle Bike shop store . We also serve the Norwalk , Lakewood , Cerritos Downey whittier , long beach , paramount and los angeles areas . Bellflower Bicycle Bike shop store . We also serve the Norwalk , Lakewood , Cerritos Downey whittier , long beach , paramount and los angeles areas . Bellflower Bicycle Bike shop store . We also serve the Norwalk , Lakewood , Cerritos Downey whittier , long beach , paramount and los angeles areas . Bellflower Bicycle Bike shop store . We also serve the Norwalk , Lakewood , Cerritos Downey whittier , long beach , paramount and los angeles areas . Bellflower Bicycle Bike shop store . We also serve the Norwalk , Lakewood , Cerritos Downey whittier , long beach , paramount and los angeles areas . Bellflower Bicycle Bike shop store . We also serve the Norwalk , Lakewood , Cerritos Downey whittier , long beach , paramount and los angeles areas . Bellflower Bicycle Bike shop store . We also serve the Norwalk , Lakewood , Cerritos Downey whittier , long beach , paramount and los angeles areas . Bellflower Bicycle Bike shop store . We also serve the Norwalk , Lakewood , Cerritos Downey whittier , long beach , paramount and los angeles areas . Bellflower Bicycle Bike shop store . We also serve the Norwalk , Lakewood , Cerritos Downey whittier , long beach , paramount and los angeles areas . Bellflower Bicycle Bike shop store . We also serve the Norwalk , Lakewood , Cerritos Downey whittier , long beach , paramount and los angeles areas . Bellflower Bicycle Bike shop store . We also serve the Norwalk , Lakewood , Cerritos Downey whittier , long beach , paramount and los angeles areas . Bellflower Bicycle Bike shop store . We also serve the Norwalk , Lakewood , Cerritos Downey whittier , long beach , paramount and los angeles areas . Bellflower Bicycle Bike shop store . We also serve the Norwalk , Lakewood , Cerritos Downey whittier , long beach , paramount and los angeles areas . Bellflower Bicycle Bike shop store . We also serve the Norwalk , Lakewood , Cerritos Downey whittier , long beach , paramount and los angeles areas . Bellflower Bicycle Bike shop store . We also serve the Norwalk , Lakewood , Cerritos Downey whittier , long beach , paramount and los angeles areas . Bellflower Bicycle Bike shop store . We also serve the Norwalk , Lakewood , Cerritos Downey whittier , long beach , paramount and los angeles areas . Bellflower Bicycle Bike shop store . We also serve the Norwalk , Lakewood , Cerritos Downey whittier , long beach , paramount and langeles areas . Bellflower Bicycle Bike shop store . We also serve the Norwalk , Lakewood , Cerritos Downey whittier , long beach , paramount and los angeles areas . Bellflower Bicycle Bike shop store . We also serve the Norwalk , Lakewood , Cerritos Downey whittier , long beach , paramount and los angeles areas . Bellflower Bicycle Bike shop store . We also serve the Norwalk , Lakewood , Cerritos Downey whittier , long beach , paramount and los angeles areas . Bellflower Bicycle Bike shop store . We also serve the Norwalk , Lakewood , Cerritos Downey whittier , long beach , paramount and los angeles areas . Bellflower Bicycle Bike shop store . We also serve the Norwalk , Lakewood , Cerritos Downey whittier , long beach , paramount and los angeles areas . Bellflower Bicycle Bike shop store . We also serve the Norwalk , Lakewood , Cerritos Downey whittier , long beach , paramount and los angeles areas . Bellflower Bicycle Bike shop store . We also serve the Norwalk , Lakewood , Cerritos Downey whittier , long beach , paramount and los angeles areas . Bellflower Bicycle Bike shop store . We also serve the Norwalk , Lakewood , Cerritos Downey whittier , long beach , paramount and los angeles areas . Bellflower Bicycle Bike shop store . We also serve the Norwalk , Lakewood , Cerritos Downey whittier , long beach , paramount and los angeles areas . Bellflower Bicycle Bike shop store . We also serve the Norwalk , Lakewood , Cerritos Downey whittier , long beach , paramount and los angeles areas . Bellflower Bicycle Bike shop store . We also serve the Norwalk , Lakewood , Cerritos Downey whittier , long beach , paramount and los angeles areas . Bellflower Bicycle Bike shop store . We also serve the Norwalk , Lakewood , Cerritos Downey whittier , long beach , paramount and los angeles areas . Bellflower Bicycle Bike shop store . We also serve the Norwalk , Lakewood , Cerritos Downey whittier , long beach , paramount and los angeles areas . Bellflower Bicycle Bike shop store . We also serve the Norwalk , Lakewood , Cerritos Downey whittier , long beach , paramount and los angeles areas . Bellflower Bicycle Bike shop store . We also serve the Norwalk , Lakewood , Cerritos Downey whittier , long beach , paramount and los angeles areas . Bellflower Bicycle Bike shop store . We also serve the Norwalk , Lakewood , Cerritos Downey whittier , long beach , paramount and los angeles areas . Bellflower Bicycle Bike shop store . We also serve the Norwalk , Lakewood , Cerritos Downey whittier , long beach , paramount and los angeles areas . Bellflower Bicycle Bike shop store . We also serve the Norwalk , Lakewood , Cerritos Downey whittier , long beach , paramount and los angeles areas . Bellflower Bicycle Bike shop store . We also serve the Norwalk , Lakewood , Cerritos Downey whittier , long beach , paramount and los angeles areas . Bellflower Bicycle Bike shop store . We also serve the Norwalk , Lakewood , Cerritos Downey whittier , long beach , paramount and los angeles areas . Bellflower Bicycle Bike shop store . We also serve the Norwalk , Lakewood , Cerritos Downey whittier , long beach , paramount and los angeles areas . Bellflower Bicycle Bike shop store . We also serve the Norwalk , Lakewood , Cerritos Downey whittier , long beach , paramount and los angeles areas . Bellflower Bicycle Bike shop store . We also serve the Norwalk , Lakewood , Cerritos Downey whittier , long beach , paramount and los angeles areas . Bellflower Bicycle Bike shop store . We also serve the Norwalk , Lakewood , Cerritos Downey whittier , long beach , paramount and los angeles areas . Bellflower Bicycle Bike shop store . We also serve the Norwalk , Lakewood , Cerritos Downey whittier , long beach , paramount and los angeles areas . Bellflower Bicycle Bike shop store . We also serve the Norwalk , Lakewood , Cerritos Downey whittier , long beach , paramount and los angeles areas . Bellflower Bicycle Bike shop store . We also serve the Norwalk , Lakewood , Cerritos Downey whittier , long beach , paramount and los angeles areas . Bellflower Bicycle Bike shop store . We also serve the Norwalk , Lakewood , Cerritos Downey whittier , long beach , paramount and los angeles areas . Bellflower Bicycle Bike shop store . We also serve the Norwalk , Lakewood , Cerritos Downey whittier , long beach , paramount and los angeles areas . Bellflower Bicycle Bike shop store . We also serve the Norwalk , Lakewood , Cerritos Downey whittier , long beach , paramount and los angeles areas . Bellflower Bicycle Bike shop store . We also serve the Norwalk , Lakewood , Cerritos Downey whittier , long beach , paramount and los angeles areas . Bellflower Bicycle Bike shop store . We also serve the Norwalk , Lakewood , Cerritos Downey whittier , long beach , paramount and los angeles areas . Bellflower Bicycle Bike shop store . We also serve the Norwalk , Lakewood , Cerritos Downey whittier , long beach , paramount and los angeles areas . Bellflower Bicycle Bike shop store . We also serve the Norwalk , Lakewood , Cerritos Downey whittier , long beach , paramount and los angeles areas . Bellflower Bicycle Bike shop store . We also serve the Norwalk , Lakewood , Cerritos Downey whittier , long beach , paramount and los angeles areas . Bellflower Bicycle Bike shop store . We also serve the Norwalk , Lakewood , Cerritos Downey whittier , long beach , paramount and los angeles areas . Bellflower Bicycle Bike shop store . We also serve the Norwalk , Lakewood , Cerritos Downey whittier , long beach , paramount and los angeles areas . Bellflower Bicycle Bike shop store . We also serve the Norwalk , Lakewood , Cerritos Downey whittier , long beach , paramount and los angeles areas . Bellflower Bicycle Bike shop store . We also serve the Norwalk , Lakewood , Cerritos Downey whittier , long beach , paramount and los angeles areas . Bellflower Bicycle Bike shop store . We also serve the Norwalk , Lakewood , Cerritos Downey whittier , long beach , paramount and los angeles areas . Bellflower Bicycle Bike shop store . We also serve the Norwalk , Lakewood , Cerritos Downey whittier , long beach , paramount and los angeles areas . Bellflower Bicycle Bike shop store . We also serve the Norwalk , Lakewood , Cerritos Downey whittier , long beach , paramount and los angeles areas . Bellflower Bicycle Bike shop store . We also serve the Norwalk , Lakewood , Cerritos Downey whittier , long beach , paramount and los angeles areas . Bellflower Bicycle Bike shop store . We also serve the Norwalk , Lakewood , Cerritos Downey whittier , long beach , paramount and los angeles areas . Bellflower Bicycle Bike shop store . We also serve the Norwalk , Lakewood , Cerritos Downey whittier , long beach , paramount and los angeles areas . Bellflower Bicycle Bike shop store . We also serve the Norwalk , Lakewood , Cerritos Downey whittier , long beach , paramount and los angeles areas .